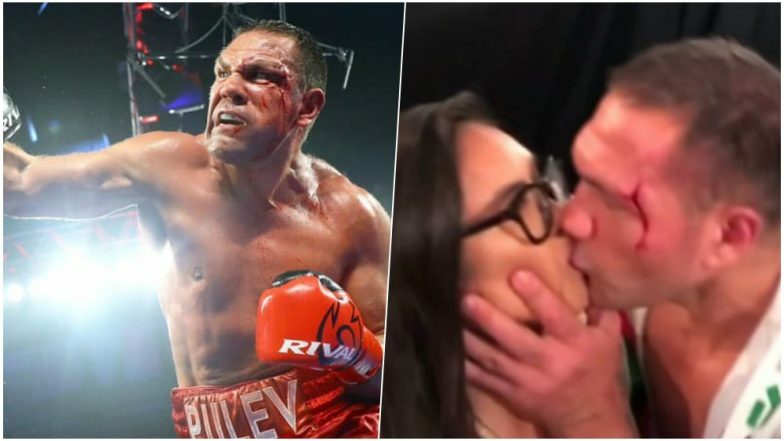 Heavyweight boxer Kubrat Pulev has been indefinitely suspended after he forcefully kissed a reporter named Jennifer Ravalo during an interview. The Bulgarian boxer kissed Vegas Sports Daily reporter on her lips when she was interviewing him after a match. The video of the forceful kiss went viral and saw major outrage against Pulev. A day later, the California State Athletic Commission has decided to suspend Kubrat Pulev. Ravalo also said that he had groped her and asked her to delete the video. She is taking legal action against the boxer. Video of Bulgarian Boxer Kissing Journalist Goes Viral: 4 Other Incidents Where Reporters Faced Sexual Harassment. The CSAC has said that Pulev will not be licensed to fight in California again. 'Kubrat Pulev must appear in front of the commission and demonstrate that he will conform to this principle of respect,' read the statement. The incident took place when Jennifer Ravalo aka Jenny SuShe was interviewing Pulev after his victory over Bogdan Dinu. When she was talking about his match and just wrapping up, he grabbed her and forcefully kissed her on the lips. Although she laughed on screen after it happened, the reporter has lawyered up and called out to Pulev. After the incident got an outrageous reaction, Pulev mentioned that she was an old friend and they had sorted it out in the after party. Jennifer claimed that she felt disgusted and humiliated after the kiss and did not know how to respond. She was quoted to TMZ report, "I did not encourage or consent to Mr. Pulev grabbing my face, kissing me, or grabbing my backside. I was there at the event covering the boxing match as a professional member of the press. Kissing a woman on her lips without her consent and grabbing her is not acceptable. "New Year's Eve 2019 Midnight Kiss Video Goes Viral: Dutch Man's Awkward Attempt to Get Kissed Irks Twitter. The shocking incident took place over the last weekend in Costa Mesa. Pulev was victorious over Romania's Bogdan Dinu. Pulev has been ordered to appear in front of the California State Athletic Commission. They have said they will "take this incident seriously". Pulev is supposed to present himself in front of the Commission in May.